Not a diver yet? No problem, join us for 2 months and become a PADI Divemaster! There are plenty of reasons to become a PADI Divemaster even if you are not yet a certified diver! Maybe you love freediving or snorkeling, or maybe you did a trial dive that was amazing, or maybe you’ve been a water baby all your life! This package is designed to turn you into a PADI Professional Divemaster in two months and includes everything that you need to get you there! 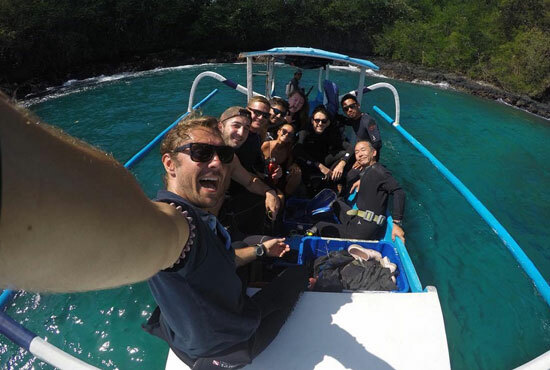 Ready to sign up for your PADI Divemaster Internship today? Can’t make your mind up? Check out our Bali Divemaster Comparison Chart! To start with, we will teach you how to dive! During your PADI Open Water course you will learn the basics of diving and practice under the supervision of our great instructors. Next comes the PADI Advanced Open Course, working to expand your skills and comfort level. Finally, after some more dives to gain confidence and technique, we will take you through the PADI Rescue course, an amazing course designed to build confidence and improve skills! You will learn how to prevent and deal with bad situations, and how to help in case someone has problems while diving. This is supplemented by your Emergency First Response course, where you will be certified in the basics of First Aid and Secondary Care. You will need to have 40 dives to start your PADI Divemaster course, so after a couple of weeks of diving then you will be ready to get into it! You will improve theory (physics, physiology, equipment), practical aspects and learn more about PADI programs and how to take on more responsibility as a dive professional. 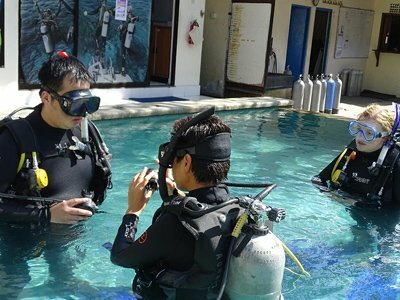 Through pool workshop and simulations, we introduce you to the professional side of the dive industry, and build your confidence to become a dive leader. We also get you diving almost everyday, and learning from our award winning instructors. We will expand your training and skills by giving you an introduction to freediving, as well as 5 PADI Specialties: Project Aware, Coral Reef Conservation, Fish ID, Peak Performance Buoyancy and Underwater Naturalist. With all this extra knowledge about the underwater world, you will become an amazing dive guide! Once certified as a PADI Divemaster, you are now part of the largest recreational dive organisation in the world! 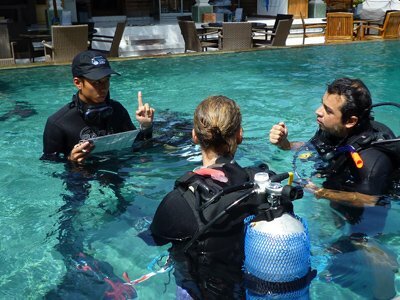 You can independently guide certified divers and assist instructors on courses. You need 60 logged dives to become an PADI Divemaster. Your current CPR/First Aid certification must be valid – within 24 months. 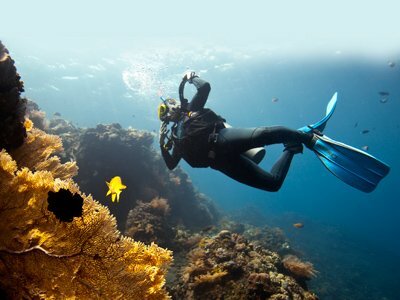 You will need a dive medical signed by a physician to clear you for diving. This package includes twin share accommodation, as well as materials and PADI Fees. Please refer to our pricing table (link) for more details or email us (link). A minimum 25% non-refundable deposit is required within two weeks of enrolment with the full balance due upon arrival. Deposits must paid via bank transfer or credit card. Balance payments can be made via bank transfer, cash payment or via credit card (no credit card surcharge applies). Want to stay longer? Check out our other DM programs.